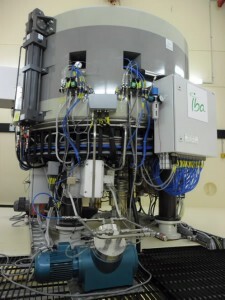 Operated by ANSTO and used by researchers from the Brain and Mind Research Institute, the National Imaging Facility Research Cyclotron is Australia’s first cyclotron dedicated to biomedical research. Situated in Camperdown, Sydney, the facility allows researchers to make potentially profound discoveries about molecules, so that we can tackle neurological disorders and just about any of the diseases associated with the human body. The cyclotron is connected with Australia’s most advanced radio-labeling and preclinical imaging facility which is used to develop and study molecular probes as they move throughout the body. These probes can measure labelled molecules and proteins in the body with amazing sensitivity. A high performance computing platform also provides advanced imaging analysis and modelling capabilities. A joint initiative of the University of Sydney and the Australian Nuclear Science and Technology Organisation (ANSTO), the NIF Research Cyclotron and imaging facility is accessible to scientists and researchers across Australia.